For my b-day last year my husband bought me a TofuXpress because I love marinating and cooking with baked tofu. It's a nifty device and does a good job of removing all the liquid from tofu so that the tofu can then absorb the tasty marinade. Before I used to press the tofu between sheet pans weighted down with heavy objects and not with always good results. This device makes it really easy. If you don't want to spend the money on the press, then the old fashioned way will work fine. Also, I noticed that more stores are carrying "super firm" tofu that doesn't require any pressing. Mix ingredients together in a medium bowl, add diced tofu, stir to cover and marinate for about 30-45 minutes until most the marinade is absorbed. Drain tofu, but reserve marinade. Spray a sheet tray with canola oil. Dry tofu with a paper towel and bake in the oven for about 20-30 minutes until golden brown and firm. Set aside to cool. While tofu is marinating and baking start cooking basmati rice. In a sauce pan on medium heat, add canola oil, basmati rice and salt and stir until rice is coated and starts to turn golden brown. Add filtered water, bring to a boil, reduce to medium-low, cover and cook for 35 minutes until done. Remove from heat at let sit for 10 minutes more before removing lid. When finished, remove lid and fluff with a fork. Set aside. Dice carrots and blanch in boiling salted water for 3 minutes until crisp-tender. Drain, and place under cool running water to stop cooking. Chop cabbage and set aside. Heat a large saute pan or wok on medium heat, add 1 tbsp canola oil, chopped Napa cabbage and chopped green onion. Cook for about 3 minutes until cabbage starts to wilt. Add spicy sauce, along with remaining tofu marinade and stir to combine and cook for another 2 minutes for flavors to combine. Remove cabbage mixture from pan and set aside. Wipe out pan with a paper towel and add 1 tbsp canola oil. 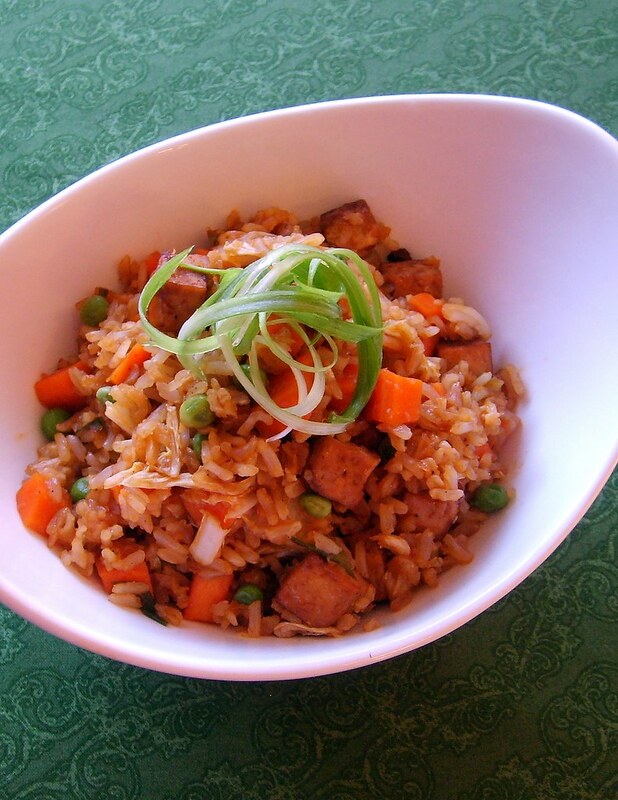 Add rice and cook for about 2 minutes, add cabbage mixture, diced carrots, green peas and baked tofu and stir to combine. Check seasoning and add salt and pepper if needed. Finish with a squeeze of lime juice and garnish with sliced green onions.